Hit the gas pedal with your career! 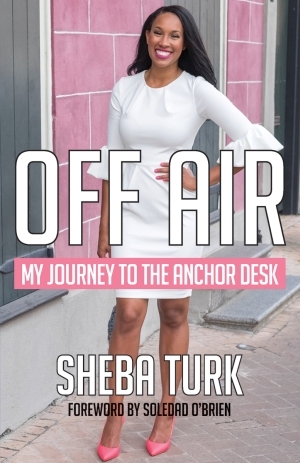 Sheba Turk is an anchorwoman like no other. Strong and capable, she forged a path to her successful career with perseverance and hard work. She seized the opportunities given to her and overcame enormous obstacles along the way. In her timely and moving book, Turk shows us that we, too, can smooth that bumpy path using the wisdom earned in the early stages of her own career. She covers topics ranging from mentorship to establishing your own brand. Off Air is perfect for anyone starting out on their own career path, particularly in media journalism or entertainment, or anyone interested in how to overcome their own obstacles, wherever their adventure may begin. A forward by Turk’s mentor, Soledad O’Brien brings this journey full circle and adds an extra level of inspiration. Born and raised in New Orleans’ 7th Ward, Sheba Turk is an Eyewitness Morning News Anchor on WWL-TV and host of The 504, a New Orleans entertainment and lifestyle program. Turk was led to broadcast news by the early influence of two invaluable mentors—former CNN executive Kim Bondy and award-winning journalist Soledad O’Brien. In addition to anchoring for WWL, Turk travels the country as an advisor for O’Brien’s PowHerful Foundation, which works to empower young women from low-income families. Soledad Teresa O'Brien is an American broadcast journalist and executive producer. She is the anchor for Matter of Fact with Soledad O'Brien and chairwoman of Starfish Media Group, a multi-platform media production company and distributor that she founded in 2013.